Racing over to the log! If the site where you hold your meetings can feature a “permanent” crossbar about 10 feet high, then your Scouts can frequently practice and enjoy this activity whenever the opportunity is presented. Otherwise, erecting the crossbar is itself a mini-pioneering challenge, and if you have the grounds, can be regularly put up by a patrol or even just a couple of skilled Scouts, prior to or during as many meetings as desired. 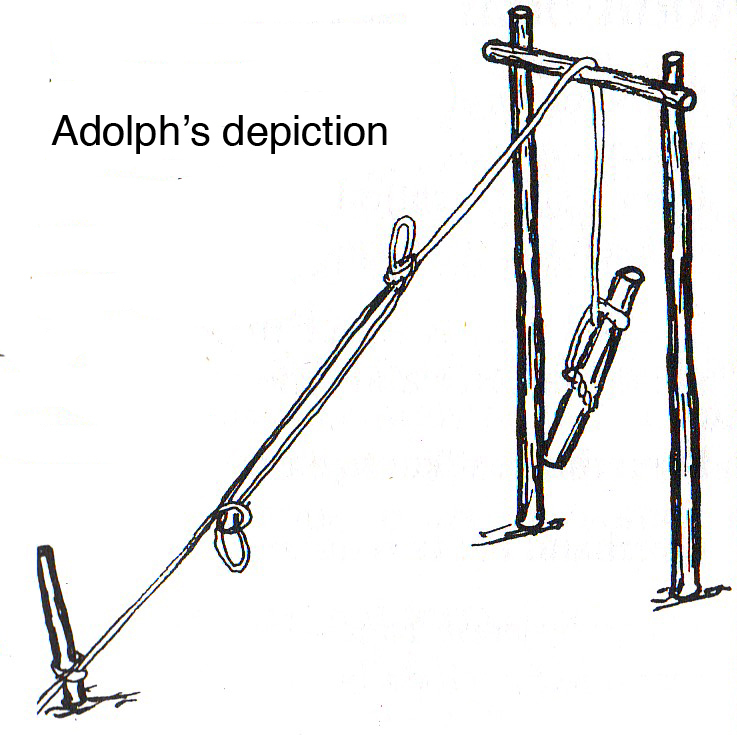 Also referred to as the Rope-Throw-Log-Lift Game and the Heaving Bar, this is an activity requiring a series of rope-handling and knot-tying skills. Because the skills that are called into play aren’t normally combined in such a sequence, and because there’s an element of fast-paced, fun competition, those Scouts knowing how to tie the featured knots most often get a kick out of giving it a go. The activity can be a competition to complete the task in the fastest time between individual Scouts or played with a team of three Scouts, each assigned a specific task. This game is intended to develop the knot tying skills of an individual Scout or of a team of three Scouts. It is important to know that the knots used (clove hitch, timber hitch, sheep shank) are each tied in a typical application for each knot. Additionally, you will develop the skills of coiling and throwing a rope. To prepare for this challenge, you should practice tying the individual knots and coiling and throwing a rope. The challenge starts for a single Scout with the rope coiled ready to throw. The rope is thrown over the cross spar. If the throw misses the mark, the Scout recoils the rope and throws again. If the throw is good, he uses the end of the rope he is holding to tie a clove hitch on the stake next to where he’s standing. Next he moves to the end of the rope that was thrown over the cross spar and uses it to tie a timber hitch around a short length of log (about 4 inches in diameter and 4 feet long). Then he ties a half hitch around one end of the log (forming a Killick Hitch). To complete the challenge, he moves to the part of the rope between the stake and the upright structure, and ties a sheep shank to shorten the rope enough to suspend the log above the ground. 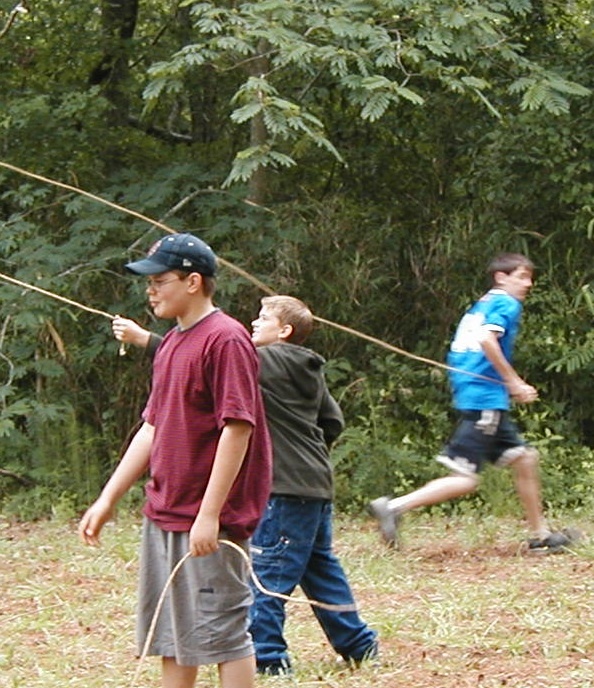 When the challenge is played with a team of three Scouts, the first Scout throws the rope over the cross spar and ties the clove hitch on the stake. the second Scout moves to the log and ties the timber hitch with the additional half hitch. The third Scout ties a sheep shank to shorten the rope and hold the log off the ground. The challenge comes when the game is played while being timed with a stopwatch. As a patrol, the times of the individual Scouts can be added up for a total patrol score. To set up the upright structure, lash the cross bar to the legs with tight square lashings. About 3/4 of the way up each crossbar, attach two guylines with a roundturn with two half hitches. Stand up the structure where it will be positioned, and hammer the stakes about 12 feet out from the legs at 45° angles. So that good tension can be applied to each leg, you can attach the guylines to the stakes with a simple rope tackle. On the throwing side, space out three stakes between the legs and hammer them in to the ground about 25 feet from the structure. On the other side space out the three logs.